Out of 117 championships in Scotland, Glasgow based clubs Rangers (54) and Celtic (44) won 98 of them, only leaving a few crumbles for all the other teams. Back in 1903, Third Lanark from Glasgow was one of five clubs aiming for the Scottish title that year. The red and white’s pulled it off, and celebrated their one and only championship. As one of the co-founders of the Scottish league, Third Lanark (founded in 1872 by an army regiment, the Third Lanarkshire Rifle Volunteers) wasn’t making headlines in the 19th century. Most of the time the club finished mid table, with a fourth place (in 1893, 1895 and 1902) as their best result. But they did win the Scottish Cup, back in 1889 beating Celtic 2-1. At the start of the twentieth century, nothing really changed. 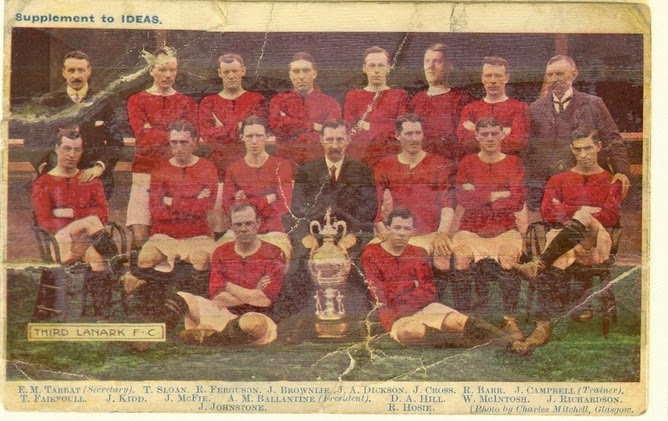 Third Lanark only managed to reach seventh place during the 1902-03 season, with James Johnstone (10 goals) and William Wardrope (7 goals) as their main goal scorers. Although not successfully on the soccer field, 1903 was something of a turning point for the club. First the club severed their links with the military and got incorporated as a company. And just as important, they took over the stadium that Queen's Park had loaned before, and renamed it New Cathkin Park, later Cathkin Park. Encouraged by these new developments, the team had bigger plans for the upcoming season. The team did have two new signings. 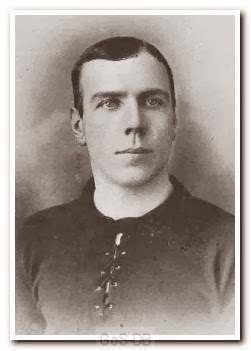 Scottish international and prolific goal scorer John Campbell (champion with Aston Villa back in 1896 and with Celtic in 1898) came from Celtic. Teammate Hugh Wilson, at Third Lanark since 1901, had an even better reputation. He was English league champion with Sunderland in 1892, 1893 and 1895 and is considered as one of Sunderlands best players ever. The other important new face in the squad was promising young striker Thomas McKenzie. Later this season, 22-year old James Comrie (who died on the battlefield in Belgium in the First World War) made his debut in the team, but only played four league matches this season. With a great goalkeeper, James S. Raeside, and two solid defenders, Robert Barr and William McIntosh, Third Lanark probably did already have one of the best defenses of the league. In midfield Thomas P. Sloan was elementary. And with the two new signings upfront, the club might have a chance of challenging the other clubs the upcoming season. Looking at the remaining fixtures, everybody at that time still expecting Third Lanark to be the next champions. They had already met every rival home and away, and were left with six matches against Port Glasgow, Airdrie, Motherwell, Kilmarnock, Dundee and Hibernian. And being the favorite didn’t paralyze the team. Quit the opposite, as Third Lanark won all their remaining matches and finished the season four points ahead of Heart of Midlothian, who had won their last five matches. Third Lanark did get the most points, but three clubs scored more goals. Defensively they certainly were the best team, with just 26 conceded goals and eleven matches with a clean sheet. Their biggest victory was a 8-2 trashing of Queen’s Park. The league was basically won by twelve players, with another five only participating in a few matches. Third Lanark’s best goal scorers were Thomas McKenzie, Robert Graham and good old Hugh Wilson, with eleven goals each. Which was slightly less than Alexander Bennett (Celtic), William Porteous (Hearts) and David Lindsay (St Mirren) who all scored thirteen goals. Rangers’ forward Robert C. Hamilton was in a league of his own with 28 goals. After this remarkable season, Third Lanark did have some good years ahead. The next season they managed third place, six points behind The Old Firm, who needed a play off to decide the league winner (Celtic won). After 1904 it took the other clubs 28 years to break the Celtic / Rangers dominion, when Motherwell won the league in 1931-32. 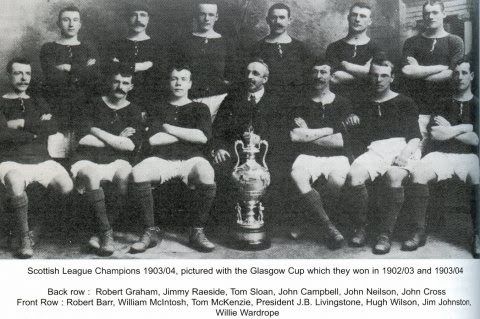 Also, Third Lanark did win the Scottish Cup in 1905 and lost the final a year later. Until the mid-twenties Third Lanark stayed at the highest level, and was back at it in the early sixties. Unfortunately, Third Lanark also struck fame by their losing streak of 28 matches, starting on November 28, 1964 and, of course, leading to relegation. Two years later, in 1967, the club went bankrupt. After four years, supporters re-formed Third Lanark, and this club is playing in the Greater Glasgow Amateur League ever since.